There were a number of big takeaways from central bankers today. The first is that the ECB is not happy with the latest jump in the euro. They came straight out and said the market misjudged Draghi’s comments – he is not talking about raising interest rates and probably won’t edge the currency higher by discussing taper until the euro eases lower. It should be no surprise that the central bank of an export dependent region with low inflation would try to prevent excessive strength in their currency. So while euro could hit 1.14, we think it will start to retreat from there. Meanwhile Bank of Canada Governor Poloz said nothing to refute the optimism of his peers at today’s central bank conference. In many ways this could be interpreted as Poloz giving his blessing to the rise in the currency. BoC Deputy Governor Patterson helped explain why the central bank is growing less dovish, because they feel that the economic shock from oil is largely behind them. For this reason, we think CAD will hold onto its gains against the Euro and we want to sell into a rally. Technically, there’s a lot of resistance in EUR/CAD between 1.4930-1.4950. Not only does the 20-SMA cross down into the 50-day SMA near that zone but the 38.2% Fib retracement of the 2015 to 2016 rally and the 50% Fib retracement of the 2016 to 2017 decline also converge near those levels. 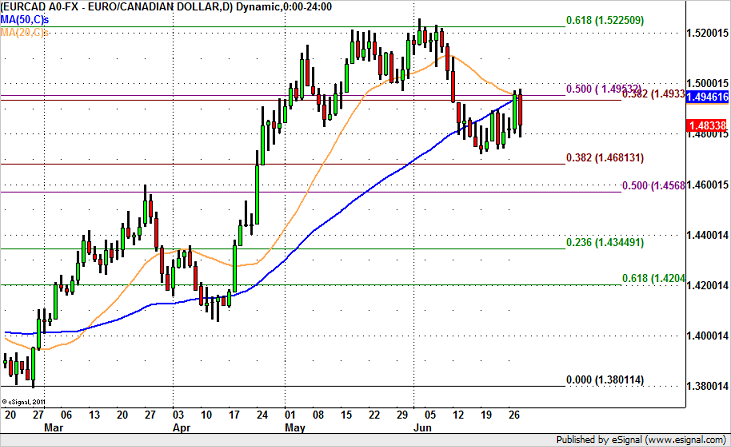 As such we believe this resistance will hold, with EUR/CAD eventually making its way back down to its June lows.